Cheap stocks are often cheap for a reason, but sometimes the market has mispriced their potential. 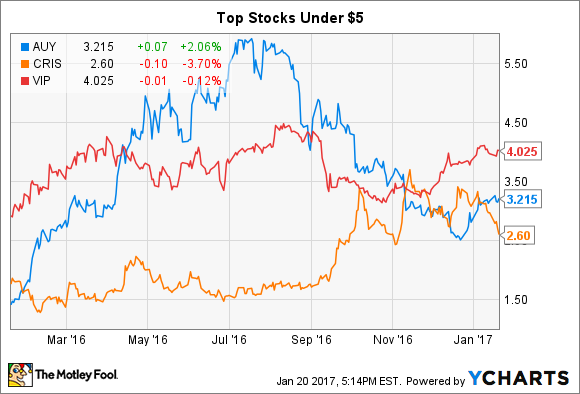 Click here for three more top stocks under $5. That fiver burning a hole in your pocket could be put to good use buying a low-priced, beaten-down company. While cheap stocks are often cheap for a reason, sometimes the market has unfairly beaten the daylights out of them and you can pick up a future winner at a steep discount. At other times, the market just hasn't fully realized their potential yet. Below are three stocks you can pick up for $5 or less per share that have beaten the market over the past year. Let's take a look at whether there is still potential for future gains. Precious metals, along with most commodities, surprised analysts with the rally they enjoyed in 2016. While some commodities continue their improbable rise -- iron ore is above $80 per tonne, double where it was a year ago -- gold faded sometime around the middle of last year, peaking at $1,365 per ounce. Although it trades at just over $1,200 per ounce now, it's still well above the $1,130-per-ounce price it went for in December. And the stock price of Yamana Gold (NYSE:AUY) has largely tracked the movements of the yellow metal, rising and falling in sync with gold's gyrations. The miner has been improving its operations, looking to bring significant new production online in 2018 and 2019, while also making smart acquisitions such as the purchase of the gold and copper mine Riacho dos Machados, which may double its output to 100,000 ounces as early as next year. With the Fed raising interest rates and President Donald Trump promising trillion-dollar spending programs, which would likely cause the national debt to mushroom, macroeconomic factors favoring higher gold prices outweigh those favoring investor confidence. Combine that with Yamana's own low-cost advantages, such as all-in sustaining costs under $1,000 per ounce, and this gold miner can remain profitable. It's a top stock under $5. Human cancer drug discovery and development company Curis (NASDAQ:CRIS) might seem to be a risky choice for an investor since it reported third-quarter results in November showing losses widening to $28 million from $5.5 million a year ago, but biotechs like this are often money losers until their drugs hit the market (assuming, of course, they do make it to market). Curis has a big shot at success with its immuno-oncology drug CA-170 for patients with solid tumors or lymphoma. The biotech began Phase 1 trials for the therapy this past summer, and it reported progressing rapidly through the dose escalation stage without any adverse safety effects that could limit its advancement. CA-170 was discovered by Indian biotech Aurigene, with Curis in charge of its development. The benefit of the drug is that it's a once-a-day pill, meaning keeping patients on a treatment regimen is significantly easier, as is monitoring side effects and effectiveness. Because a cocktail of therapies may be the future of cancer treatment, a daily pill is easier to control for than treatments that occur over an extended period of time. Curis might not be a stock that should command a large position in your portfolio, and there is still a long time to go yet before CA-170 hits the market, if it ever does, but the early signs are positive, and the biotech's low price just might be right for the high-risk portion of an overall well-balanced portfolio. It's a top stock under $5. An investment today in Vimpelcom (NASDAQ:VEON) shouldn't be based on the company's history of being a traditional voice and data telecom, but rather on its ability to transform into a mobile internet services provider dealing in internet services like banking, ride-hailing, and messaging. A recent Reuters article described the change happening at Vimpelcom as nothing short of revolutionary for the industry. "The reinvention by one of the world's top ten mobile operators is the clearest example yet of a major telecom company deciding to join the tech sector rather than trying to beat it and may put pressure on others to follow." The key will be whether it can successfully migrate to such a platform. It is forgoing the incremental steps being taken by companies like Verizon, which are buying pieces of new businesses here and there, and instead making investments in businesses (such as Uber) that will rely upon the services it intends to offer while overhauling its network systems in 11 countries. The risk is that the new business will be just as competitive as the old -- but at least the new industry is growing, whereas the old one is on the wane. With more lucrative options open to it, Vimpelcom's low, single-digit stock price may make now a great time to buy shares. .